If you don't follow me on Twitter or Facebook you may not know that my 8 year old daughter is obsessed with Star Wars. Obsessed might not even be descriptive enough of a word for it; consumed, engrossed, preoccupied, these are just a sampling of words to describe how she eats, sleeps and breathes Star Wars. 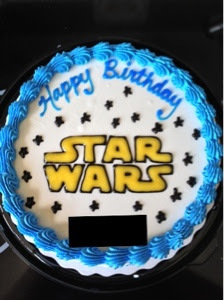 She wanted a Star Wars party for her 8th birthday, which I thought would be easy at first, until I realized that the entire internet assumes that only boys like Star Wars and all the party games & crafts were geared to the male gender. 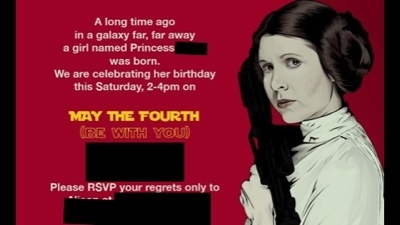 The other issue was that only one of her girlfriends had ever even seen any of the Star Wars movies, so many references would be lost on the girls at the party. I had to strike a balance between the Star Wars theme and keeping it general enough that all the girls would enjoy themselves. She wanted an ice cream cake and fortunately the cake decorator at the Southview Dairy Queen was able to accommodate her request. My mom found a craft online for the girls to do. Unfortunately it involved a glue gun which meant that I walked around with blistered fingers for several days after the party. 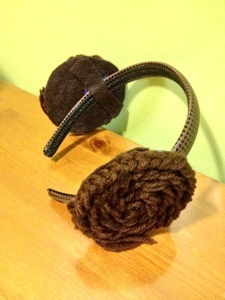 The girls braided yarn which I then glued onto felt and a headband to mimic Princess Leia's distinctive hairstyle. The girls drank "Yoda Soda", Sprite with lime sherbet in it, and snacked on unnamed cheese, crackers, veggies and dip (I'm generally not one to fancy-up food, as long as it tastes good and doesn't give anyone food poisoning I'm happy). 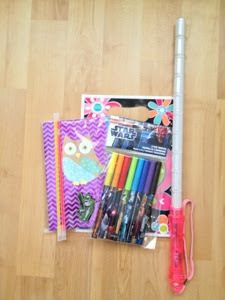 I was able to keep quite closely to the Star Wars theme for the goodie bags: Star Wars markers and eraser, pink lightsaber, wrist glowsticks and a notebook. Her obsession doesn't stop there. 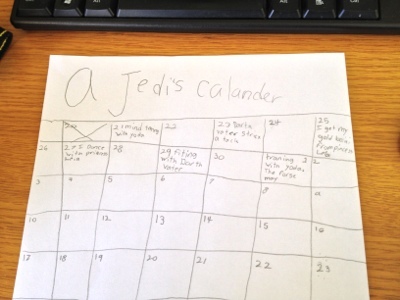 As I pick up after the kids around the house I find many other Star Wars treasures, such as "A Jedi's Calendar", Star Wars family trees, character books, and believe it or not, fan fiction (I've posted 1 page from one of her story books at the end of this post). She talks about Star Wars so much that sometimes at supper we have to tell her to stop, we just can't listen to any more information about Star Wars or answer questions about which character is our favourite. 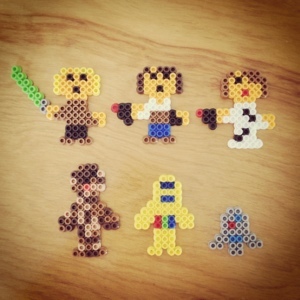 She also created an original pattern for perler bead Star Wars figures which she made and entered into the Stampede Exhibition and shockingly only got 4th place for. A picture of them is below as well. Now don't even get me started on my 5 years old's obsession with Taylor Swift songs and how she changes the lyrics to be about me. "I knew mommy was trouble when she walked in, shame on mommy now..."